Womens Institute to celebrate 90 Years. November 21, 2018 November 2018 Comments Off on Womens Institute to celebrate 90 Years. The Martinborough Branch of the NZ Womens Institute will celebrate their ninetieth birthday with a function at Tirohana Estate on November 27th. Around fifty guests will include the New Zealand President Fay Leonard. The Martinborough Branch was formed from a meeting held at the Parish Hall on 27th November 1928 at the Parish Hall. 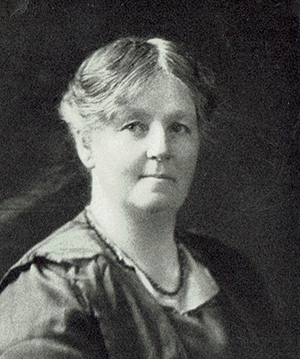 Mrs John McLeod was elected President, a position she continued to hold until 1935. Mrs Jolly was elected Secretary along with an eleven member committee. By the 1930s the Martinborough Branch membership had reached eighty. Meeting agenda from through the years show how the Institute’s original objectives have stood the test of time. Sharing home making skills, Providing friendly social contact, learning crafts and helping others have been continuing ideals. A motto being ‘If you know a good thing pass it on’. The Institute came into its own during the 1930s depression years. Lists fro the time record huge amounts of every kind of food being collected and along with prepared meals distributed to needy families. Children’s clothes were made and along with donated clothes also distributed. During WW11 food parcels were made up and sent along with knitted and other needed items to Britain. Parcels of small luxury items were put together for the troops. Making donations to various worthy causes has been a part of the Institute’s programme. The list includes Red Cross, Wharekaka, Life flight Trust, Fred Hollow’s Foundation and The neurological Foundation to name but a few. Among the correspondence was a 1946 letter from the Cape Palliser lighthouse keeper’s wife thanking the Institute for its support to her as a correspondent member. The letter told of her, and the other keep’s wife’s isolated life where contact with the outside world was intermittent at best and of their, by necessity, completely self contained lifestyle. There are thirteen Institute Branches in the Wairarapa with the Wairarapa President currently being Carol Wingate. The Martinborough President is Betty Finlayson, Vice-President Noeline Bain, Secretary Nolene White and Treasurer Megan Philip. Our speaker last month was John Gilberthorpe. A year after arriving in Greytown in 2008 John joined Greytown Little Theatre (GLT). In 2017 he was elected President. Looking back, the theatre was founded in 1921 by Mr and Mrs Thompson (of Thompson and Tait from Wellington) making GLT one of the older community theatre groups in New Zealand. The theatre has been very active for many years and under the guidance of the late Noeline Ball and Enid Nixon in the 1990s and early 2000s the group thrived. They presented musical productions and plays in a range of venues including the Greytown Town Hall. The theatre group purchased the old Farmers’ Co-op building at 68 Main Street and opened it as a theatre in 2005. Following the Christchurch earthquake building owners were required to get engineer’s assessments of their buildings. The subsequent report was not good. The building was high risk being only15% of code and built of unreinforced masonry. The wisdom of continuing to use the building was debated and it was decided that GLT needed to act. In 2017 a full feasibility study was undertaken of the options. It was agreed that the theatre needed to be made fit for purpose providing much improved facilities for both the audience and members working on the production. Three options were identified: strengthening and reconfiguring to improve the layout, demolition and rebuilding to a similar plan or selling the site and rebuilding on another location. The first two were totally unaffordable after a QS report, so the last option was decided. A site was found in the southern end of West Street, owned by the South Wairarapa District Council. In September 2017 the SWDC agreed to a long-term lease at a peppercorn rental. The new building will include a flexible auditorium space with retractable seating, foyer, improved dressing rooms, green room and storage for costumes and equipment. It is hoped that the theatre can be opened within the next two years, but this will be subject to full funding being secured. The old theatre has been sold and GLT will vacate the premises by 19 October. In the meantime, GLT will continue to operate and will perform at other locations in the town and at pop up locations. As well as considering the past and present, the theatre group has also had to think about the future. To this end, in the last two years its members have worked closely with Kuranui College students to encourage a younger group of members. In conclusion, John advised that the GLT has had generous support for the project from the wider community including Trust House Foundation, Greytown Lioness Club, Rigg Zschokke Limited, Masterton and Perception Planning, Martinborough, Although John did not ask, I gained the impression that any donations would also be very welcome. South Wairarapa Rotary held the biennial youth awards night at the South Wairarapa Workingmens’ club this month. 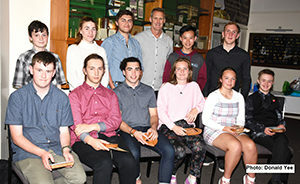 12 of South Wairarapa’s most inspirational youths were recognized with a plaque and small gift that acknowledged their outstanding achievements in their schools, workplaces, homes, and in the wider community. Recipients were: Isla Alexander – Service to sport. Samson Dell – Leadership, sport. Joshua Oakly – Overcoming adversity, courage. Heidi Redfern – Academic excellence. Amberleigh Rose – Achievement in poetry and speech leadership. A J Southy – Achievement, performing arts, leadership. William Taber – Achievement in music, leadership. Danielle Turton – Achievement , sport. Cohen Walford – Making a difference. Alex Walshe – Overcoming adversity, achievement in dance. Jarrod Yee – Achievement in sport, leadership..
Scott Donaldson, recently returned from his record-breaking solo Kayak crossing of the Tasman Sea, was keynote speaker and was on hand to present the awards. Scott emphasised the importance of preparation and tenacity and encouraged the awardees to ‘hold their heads up and be proud of themselves’ as those celebrating their achievements were also proud of them. The Martinborough Fair preparations are under way ready for February and March next year. Last year’s fair raised over $90,000 for distribution in the Wairarapa and internationally. Four Bursaries have been made available from those funds, allowing up to four very deserving students to be selected from 10 applicants to undertake tertiary studies. Applications for bursaries can be made at swrotary.org.nz. Applications for other forms of community funding made possible by this very successful fund-raiser can also be found on our website (swrotary.org.nz). Each year, Rotary sponsors a student to the New Zealand Science Forum. We have a successful candidate already and we are looking forward to hearing all about his experiences at the forum. The Innovative Young Minds (IYM) program is designed to encourage young women to explore science, technology, engineering, mathematics and high-tech manufacturing – fields we call the STEMM sector. The week-long residential program is open to female Year 11 and Year 12 students, and runs during the July school holidays each year. This year, South Wairarapa Rotary sponsored two young women and we are looking forward to hearing about their experiences at the course soon. Photo caption: (back row) Cohen Walford, Heidi Redfern, A J Southey, Scott Donaldson, Jarrod Yee, Harvey Morison. (front) Joshua Oakly, William Taber, Samson Dell, Isla Alexander, Daniel Turton, Alex Walsh.